Pedra Azul State Park (Portuguese: Parque Estadual de Pedra Azul) is a state park in the state of Espírito Santo, Brazil. The Pedra Azul State Park was created in 1991 to protect the natural heritage of the region, and in particular the Pedra Azul (Blue Stone), a granite rock formation reaching a height of 1,822 metres (5,978 ft). The park covers 1,240 hectares (3,100 acres). Temperatures range from about 7.3 to 27.8 °C (45.1 to 82.0 °F). Altitude ranges from 1,250 metres (4,100 ft) at the visitor center to 1,909 metres (6,263 ft) at the peak of Pedra das Flores, the highest point. The park covers parts of the municipalities of Domingos Martins and Vargem Alta. It became part of the Central Atlantic Forest Ecological Corridor, created in 2002. Jump up ^ Parque Estadual de Pedra Azul – Pedra Azul do Aracê. Jump up ^ Lamas, Crepaldi & Mesquita 2015, p. 101. 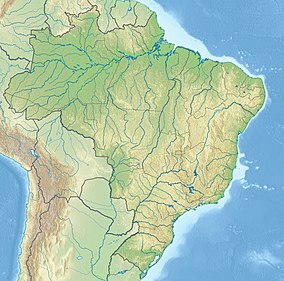 Wikivoyage has a travel guide for Pedra Azul State Park. Wikimedia Commons has media related to Parque Estadual da Pedra Azul.